Heck, Yes to carrots! 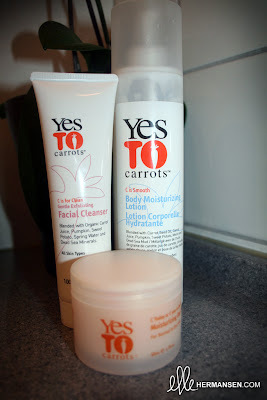 I tried this product back home in Canada when I smothered myself in the "Yes to Carrots" body lotion. The smell of sweet potatoes, carrot and pumpkin juices, mega moisturizing essential oils with a touch of melon and of course, honey(!!!). It's hard for me to not eat my own arm off - it smells THAT good! Being in Norway, I haven't come across any places that carry these natural, paraben-free products. I finally found the "C you today C you in the morning" Moisturizing Day Cream and "C is for Clean" Gentle Exfoliating Cream online. I have tried the most expensive products and I have to say, I love this line! You can get these products at Shoppers Drug Mart in Canada or even Walmart for ridiculously cheap!